As a service provider you want to build a reputation for fast, reliable access to the Internet. You also want to grow your business by keeping your costs down and add more subscribers to your network. Unfortunately, the explosion in Internet video and social networking sites means customers are demanding faster speeds and more bandwidth. If supply is limited and upgrading your capacity is too expensive an option, you’ve got a problem!You need a way to use your existing bandwidth more effectively, making better use of what you’ve already got.A web caching server is the obvious solution. Most caching vendors add functionality that’s just not important to service providers but still expect you to pay a higher price.That’s where the ApplianSys CACHEBOX can help. Our experience with service providers around the world has shown that whether you’re in Ghana or in California, CACHEBOX is the ideal solution when Internet bandwidth is in short supply or very expensive. 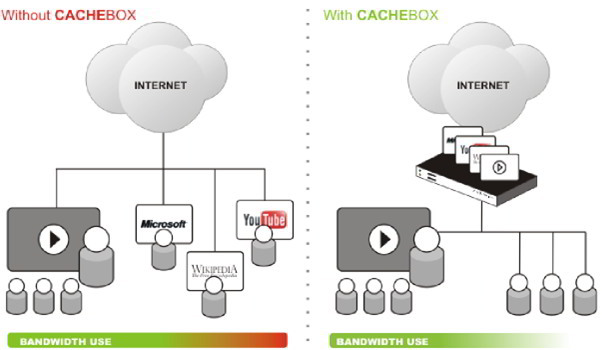 CACHEBOX reduces bandwidth use by caching http traffic and content from popular video portals like YouTube and social networks like Facebook. It offers you further savings by caching software updates from vendors like Microsoft, Apple and Adobe. Lower bandwidth use keeps your costs low because you don’t have to upgrade to more expensive transit links. Lower costs mean you can drop your prices below your competitors to attract more business. What’s more, the additional free space lets you increase the number of subscribers on your network without decreasing the quality of your service. By bringing content closer to your customers, CACHEBOX increases average response rates and speeds up file downloads. Subscribers will be happier with your service and stay loyal for longer. More free space also means you can offer new services like Voice over IP, or charge premium prices for quality service. ApplianSys has designed CACHEBOX to be quick to deploy, simple to use and easy to maintain. Now you have one less thing to worry about. CACHEBOX310 and CACHEBOX230 use Solid State Drives (SSD), giving you up to 3,600 HTTP requests per second in a 1U format. If you have a very heavy caching workload, clustering will deliver higher performance. Depending on your type of traffic, the ‘230’ can support more than 10,000 users per appliance at 300Mbps, with ‘310’ supporting upto 20,000 users at 500Mbps with a single unit. Other vendors only offer this level of performance with bigger, more expensive devices. CACHEBOX210 is perfect for small ISPs, and gives you excellent performance at a low price point. CACHEBOX100 is a 1U rack-mountable appliance best suited to very small ISPs. CACHEBOX050 has the same features and performance level as the ‘100’ but is a small form factor device, about the size of a standard laptop. You can use them alone or with CACHEBOX200 series appliances deployed further upstream.